The cut-resistant glove that helps protect your non-cutting hand when you rotary cut! Stainless steel woven with cut-resistant fibers. 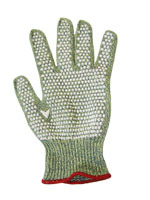 One glove fits right or left hand - Rubber dots for gripping - Comfortable to wear - Machine Washable. Washing Instructions: Hand or machine wash in warm water with mild detergent. Lay flat to dry. WARNING: Glove is cut-resistant - not cut-proof - and not puncture-resistant. Do not use near moving or serrated blades.